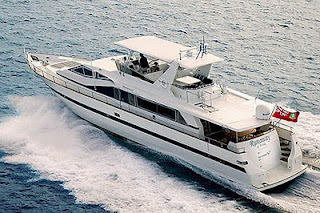 Here are some more excellent comments / testimonials from charterers that Paradise Connections had aboard the charter yacht Drumbeat... one of our favorites! 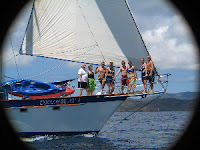 This year we had the joy of taking two charters on board the Drumbeat (June 2011 & February 2012). The first was in June (see comments here) and was a family celebration of several birthdays and anniversaries with our daughter, son-in-law and 3 grandchildren, a girl (11) and twin boys (12). It was a fantastic 8 day trip. 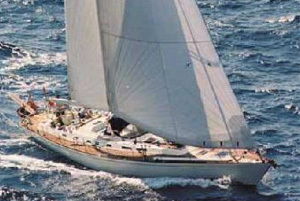 The Drumbeat is a beautiful very well kept up roomy sailboat. 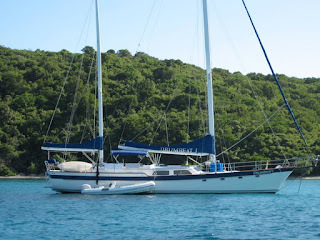 We originally were looking for a catamaran but after seeing the pictures of the Drumbeat we chose it and had no regrets. There was plenty of room on board for 4 adults and 3 kids with a spacious salon for all of to enjoy dinner together although we spent most of our time on deck or in the cockpit. Vince and Linda were fantastic hosts and along with Kirk took great care of us all. The meals were all outstanding and how Linda can create such masterpieces from such a small galley is mind boggling. Each meal was better than the one before. We were especially impressed with the fresh bread every day, and Linda would set the dough out to rise each morning. Another highlight of the day was happy hour and snacks every evening before dinner. Very creative and tasty snacks and we kept the blender running with adult drinks and (mostly) smoothies for the kids. But we didn't just eat all the time (although we would have been quite happy to do so). 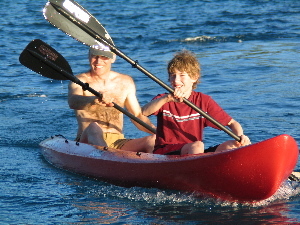 The days were filled with fun water activities: snorkeling, paddle boarding or just swimming. Our grandchildren had taken scuba certification training before the trip and completed their open water training and referral dives off the Drumbeat under direction of Captain (and diver instructor) Vince. Vince was great with the kids and a patient but very thorough teacher. 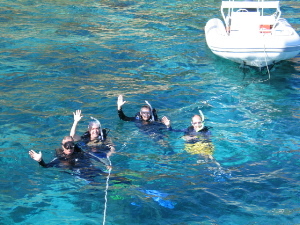 The kids had fun, learned well and before you knew it they were certified and off on real dives. Three of the four of us adults are divers also, so it was fun to be able to dive as a family. We had wonderful dives with the highlight diving the wreck of the HMS Rhone. As for the kids, well, how many people get to do a wreck dive for their final certification dive? We all had a fantastic time and swore we'd return. This time it was a dive trip/retirement celebration for myself and a colleague who also retired from our company along with our wives, neither of whom are divers. Another outstanding sail on the Drumbeat with Vince and Linda. Once again the food was outstanding and the boat was pristine. With only 4 adults and without the kids it was a much quieter and more relaxed sail this time. Since it was February the weather was a bit cooler and drier than in June, the winds were stronger than the first trip and we spent more time under sail than we were able to previously. Also, since there were only 4 of us we were able to pick up the Drumbeat on St.Thomas and didn't have to ferry over to Tortola to meet up with the boat. Once again, the diving was great and Vince is a fantastic dive instructor. I've been diving for 20 years all over the world and the reefs of the BVIs are as pretty and filled with life as any I've seen anywhere else. The corals and sea fans seem to be healthy and the fish are plentiful. You shouldn't plan to see the big pelagics, but lots of reef fish, lobsters, turtles and even some spotted eagle rays. For divers, just be aware, this is a sailing trip with diving, which is what we wanted, not a dive trip with sailing. 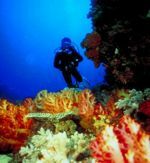 If you are interested in multiple dives per day, every day, then go on a live aboard, not the Drumbeat. This is meant to be a relaxing vacation with the opportunity to do some very nice diving. We spent more time snorkeling in quiet coves or relaxing on deck than under water, which was just fine with us. Drumbeat is a 72-foot Irwin ketch with a crew of three, owned and operated by Vince & Linda, and assisted by Kirk, a longtime crewmember. Drumbeat is fully air conditioned and accommodates up to 8 guests in 4 double cabins, each with private ensuite head/shower. A great choice for families, group of friends, and honeymooners too! 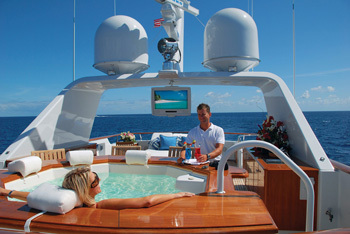 Just finished updating the Alaska & Pacific Northwest yacht charter page on our Paradise Connections website: Check it out! The charter yacht SINGLE STAR, offers fly-fishing and wildlife enthusiasts an ultimate Alaska adventure trip with their eco-tourism cruise. Read previous blog post. 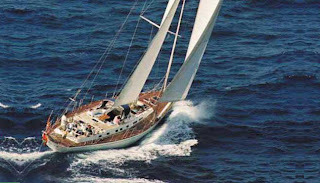 The charter yacht OCEAN PEARL is offering 9 nights for the price of 7... Read more here (soon come). 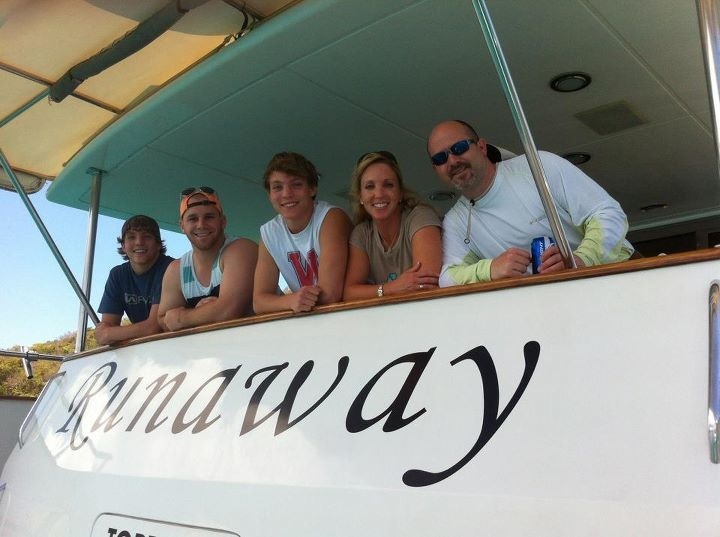 We would like to share comments we received from a family group of 6 that Paradise Connections had aboard the charter yacht RUNAWAY, an 82-foot Azimut motoryacht, this past March. Did you find your crew to be helpful, accommodating and friendly? Jim and Lisa were phenomenal. Was the yacht comfortable, clean and well maintained? Unbelievable. How would you describe the quality and presentation of the meals served on board? 5-star presentation, quality was perfect. How did you find the services offered by Paradise Connections? There was nothing we were wanting, so awesome. Would you be interested in taking another yacht vacation in the future? Yes. If so, would you like to charter the same yacht and crew? I would only charter Jim and Lisa. Although there may be other qualified persons out there, I just cannot believe someone can do more, provide more or be more enjoyable than those two. Did you stay in a hotel before or after your charter? Ritz, it was fine. Are there any further comments or suggestions you would like to make to enable Paradise Connections, the yacht, or crew to better serve you and other clients in the future? It would be impossible to educate people on all that Jim and Lisa really offer on the charter. When we decided on the Runaway, we were uneducated in the process and truly did not know what we should be looking for. Obviously the Runaway sells itself. 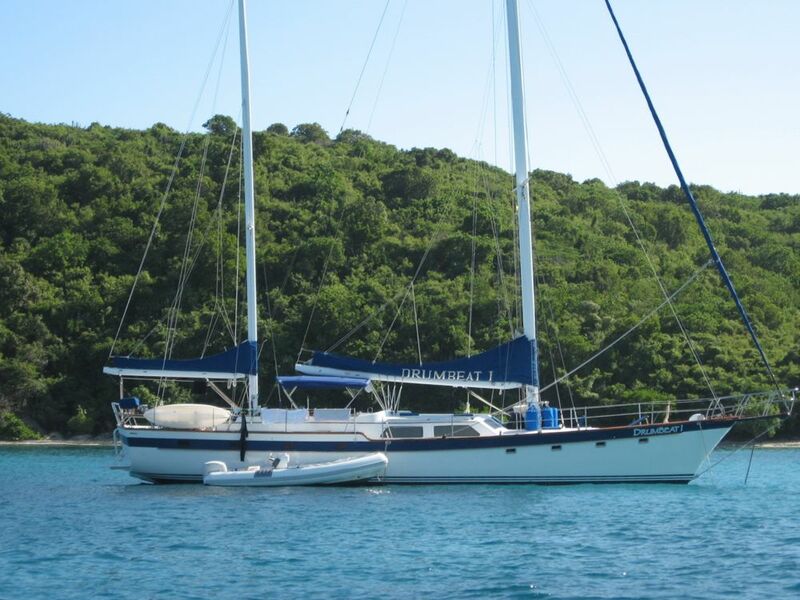 It is a beautiful boat, impeccably maintained and offers every amenity. However, having now completed the trip, the crew is what really makes the experience all that it can be. Both Jim and Lisa were absolutely wonderful. They made us feel right at home, acted like family but treated us like royalty. I cannot even begin to describe how amazing our dining experience was on the boat. Every meal, every snack and every place setting was prepared better than any 5-star restaurant I have been to. Lisa has a very special talent in the kitchen. It makes my mouth water thinking of her cooking. Oh my goodness, it was great. Jim was fantastic too. A gracious host and truly a learned Captain. He was engaging and entertaining. He took us to great spots and obviously made look easy his efforts to position us in every great location to enjoy each stop. The Runaway is an amazing yacht that is worth every penny. But people really need to know that the boat is only 20 percent of the experience. Jim and Lisa make the Runaway larger than life. Honestly, if Lisa could cook the food on a 15ft Tender and Jim was manning the boat, I spend a week on that dinghy with them-- I know it would be a blast. I cannot tell you how fabulous our trip was!!! We had the time of our life and made some new friends for life. We spent our Spring Break with our kids on the Runaway with Jim and Lisa and had the best trip ever! They picked us up on the beach [from the Ritz] and from that moment til we stepped off was total luxury! We had 5-star meals everyday and it was such a treat to go where the cruise liners couldn't!! Jim and Lisa took us to places we would have never found on our own and we all have such great memories from each and every day. I highly recommend that everyone at some point in life MUST do a trip like this! M/Y RUNAWAY is an 82-foot Azimut motoryacht with an owner-operator crew of two. Runaway is fully air conditioned and accommodates up to 8 guests in 3 cabins. All staterooms have en-suite head with marble or granite countertops and enclosed shower stall. Each bedroom also has its own LCD flatscreen television with dvd/cd/mp3 player and individual climate control. The salon now boasts a 52-inch LCD TV for their Satellite TV. Jim is a dive instructor and Runaway offers diving for their guests. 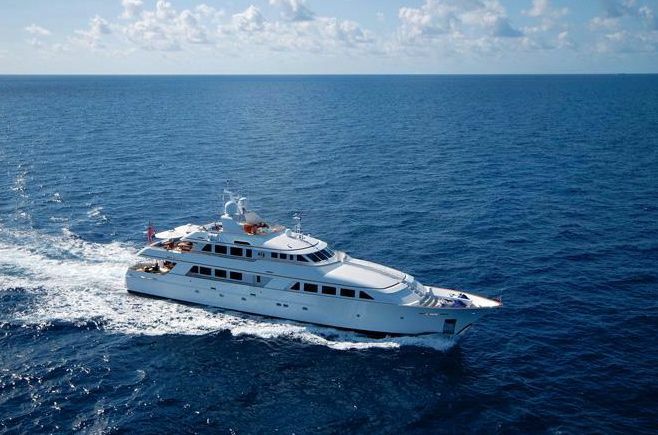 The charter yacht LADY J, a 142-foot Palmer Johnson motoryacht, announces a special offer of a $10,000 discount for any new charters confirmed by April 30, 2012. This promotional offer excludes the holiday week of December 21-28, 2012. Lady J, under the capable leadership of Captain Sandra Yawn and her 8 crew, look forward to welcoming you aboard. The Lady J accommodates up to twelve guests in five outstanding staterooms. 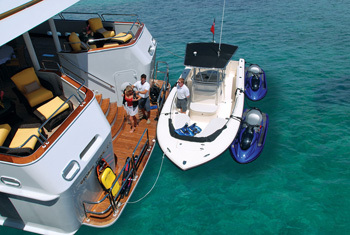 This beautiful yacht is configured with a king master, two queens, and two twins with trundles. Each cabin is unique but each is equally luxurious and appointed with sumptuous soft goods and linens. Every guest stateroom has ensuite facilities that include a shower and tub, generous storage, and a full entertainment system including flat screen TV / DVD / CD and iPod connections. 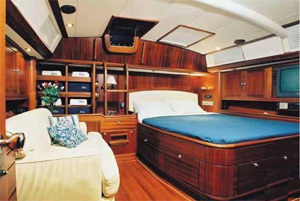 The ambiance of the staterooms is that of a classic ocean-going yacht with rich wood finishes and traditional details. Charter Yacht BANYAN : Florida Bahamas 33% Discount! 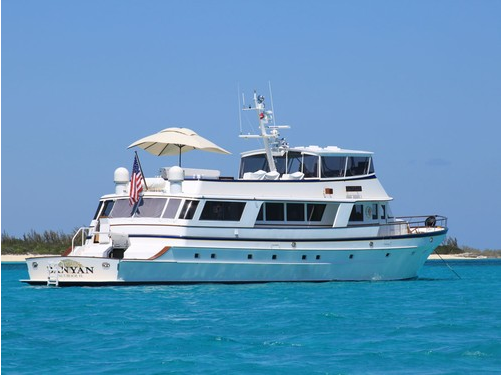 The charter yacht BANYAN, a 102-foot Palmer Johnson classic motoryacht, is slashing their rate for charters originating in South Florida and cruising in the Florida Keys and Bahamas. Welcome aboard! When you’re ready we slip the mooring lines and head out into Skopea Limani. After a short sail we drop anchor off one of the many stunning islands for a refreshing swim and light lunch. Afternoon sail south to Sarsila, a bay with pine trees down to the water’s edge. Anchor for the night with a stern line ashore, clear water and Turkish taverns ashore. Leave Sarsala after breakfast to sail north to the island of Yassica for lunch and a swim. After lunch, sail east across the gulf of Fethiye to the island of Kizil and one of the best restaurants in the area, a converted light house. Dine on the cliff top with beautiful views overlooking the gulf of Fethiye. Sail to the Batikkaya Buku, a bay just outside of Fethiye town. A night stop option to moor in ECE marina or free swinging at anchor. Fethiye holds the best shopping opportunities of the week. Take an afternoon walk around the town or relax on Mira, your floating hotel. Leave Fethiye town and sail back across the Gulf of Fethiye to the crystal clear water of Regged Bay where we anchor with stern lines ashore. Regged Bay is one of the many picturesque nooks and crannies along the outside of Skopea Limani. From Ragged Bay you can take a wonderful walk to the ruins of Lydia which date back to Byzantine times. From Ragged Bay sail out of the Gulf of Fethiye to Cold Water Bay, stopping on route for lunch at one of the many inlets. Cold Water Bay, one of the crew’s favourite stopovers, has a fresh water spring cooling the water. After breakfast a short sail round to Oludeniz, a long sandy beach offering many ‘water sports bars.’ An option for the more adventurous is paragliding from Babadag, the mountain Icarus is said to have flown from! Spend the night in Butterfly Bay with lines ashore. Sail back across the gulf of Fethiye through Scopea Limani towards Gocek. Stop on route for a swim and lunch before disembarking in Gocek. MIRA, a 70-foot Norlin/Sweden Yachts sloop, accommodates up to 6 guests in three ensuite cabins: 1) King aft master has an overstuffed sofa; 2) forward port guest cabin has a double bed; 3) forward starboard cabin has upper/lower singles. The charter yacht MIRA, a 70-foot sloop, has just been launched after their winter maintenance and is gleaming and ready for summer Mediterranean bookings for sailing vacations in Greece and Turkey. Based in Gocek, Turkey, Argan Bailey has been on MIRA for over 8 years. He was Mira's chef for 3 years before moving up to captain. Argan grew up sailing and working alongside his mother, a well-known caterer for exclusive weddings in England. Chef Athene Macrae creates healthy and exciting menus inspired by Italian, French, Middle Eastern, Spanish, Indian and Asian cuisines. Athene uses the freshest ingredients – organic when available – and will catch, prepare and serve fish fresh from the Mediterranean on the table in minutes. You deserve a wonderful vacation like this. 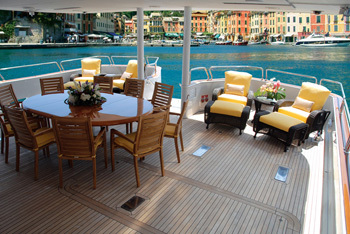 Enjoy being pampered aboard Mira and experience the sights and sounds of the Eastern Mediterranean. Contact us!